This is a Nexus Exclusive. 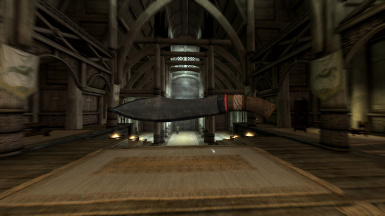 This mod is a 2K knife made after the Tribal knife used by Sheva Alomar in Resident Evil 5. 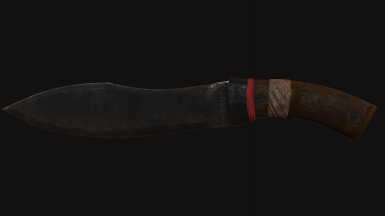 This is a new knife with a unique mesh and textures. 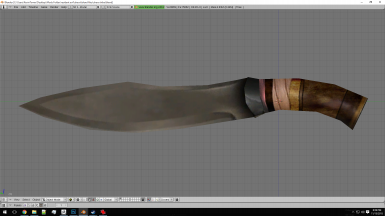 Its based off of the knife used by Sheva Alomar in Resident Evil 5 when you unlock her Tribal alternate costume. 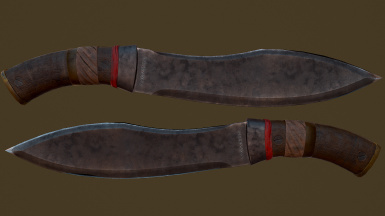 I originally considered porting that knife over from the game for my personal use but the mesh and texture for it were really low resolution and not really worth my time. So instead I remade the weapon in Zbrush and did my best to improve upon the original design while at the same time remaining faithful to the original game asset. It has the same stats as ebony and requires the Ebony smith perk to craft. At the moment it is not added to loot tables. I am intended to add this weapon to Fallout 4 but its gonna take awhile for us to get the updated CK so I wont be able to add it to that game until then. In the meantime it will be available for Skyrim^^. Either throw the folders into your Data directory or use the Nexus Mod Manager/Mod Organizer to do it for you. Either use Nexus Mod Manager or Mod Organizer to remove the files for you or manually remove them from you Skyrim/Data folder. I plan to upgrade and improve this mod over time as I fix bugs, think of new ideas, become more adapted to the CK, and so on. Be sure to check back in once and awhile for updates. Be sure to completely uninstall any previous versions of this mod before upgrading though. I will not take responsibility for corrupted save games or lost save games. Get into the habit of backing up your saves to protect your game data. Ignore at your own risk! This mod will be incompatible with any other Dragonbone retexture mods or recolors of the Dragonbone armor. This includes the Dragonbone Ebonsteel Armor retexture. You can find me on the Nexus Forums here as Natterforme. Thanks to SkyrimNexus.com for the a one-stop-shop resource for authors and players. Thanks to all of you who have encouraged me and have supported me since I first put up screenshots of my work back in December 2011 and January 2012. I thank you all for your patience with me^^. Thanks to God for creating us all. Amen. 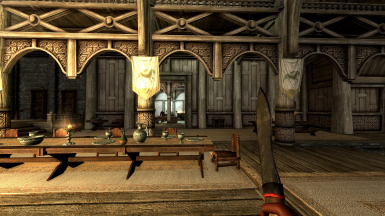 This is a Skyrim Nexus Exclusive. You MUST contact me before you do anything with this mod in any form for any reason. This includes language translations. I will NOT be providing Steam Workshop support at this time. Neither I nor McMuffin wish to see this mod on the Steam Workshop for the foreseable future. I do not feel comfortable with their legal policies towards modding so I will not use it. I will not support or endorse its use at this time. If I want it to be on Steam, I will do so myself. If you see this on Steam, LET ME KNOW! I will not support any version of this mod found on Steam. I will not accept any childish excuse about "sharing" with the community. If you refuse to respect my wishes, I can not, in good faith, respect yours.